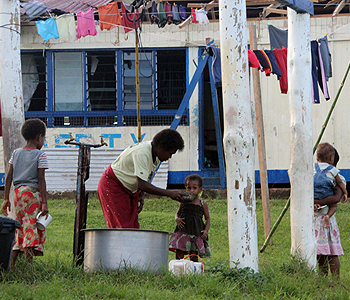 5 percent of the country’s population is currently staying in evacuation centres after Tropical Cyclone Winston. Minister for National Disaster Management Inia Seruiratu confirmed that 45,245 people are currently sheltering at 275 evacuation centres around the country. 16,135 people are staying at evacuation centres in the Central Division, 22,181 people are staying at centres in the Western Division, 2,700 in the Eastern Division and 4,229 in the North. The death toll after Cyclone Winston stands at 42 however this number is expected to increase further. There are reports of 122 people getting injured during the cyclone while 45 people have been hospitalized. Finance Minister Aiyaz Sayed-Khaiyum said Fiji suffered more than $1 billion worth of damage after Tropical Cyclone Winston. This number is expected to increase as damage assessments are still underway. In a press conference in the last hour, Sayed-Khaiyum said there is a lot of damage to homes, agricultural crops, infrastructure and utility services like water and power. He said the banks have agreed to give 4.5 percent interest rate to offer 5 year term loans to individuals and small businesses affected by the cyclone. The Minister also stressed that there will be no fees charged if people and organizations want to send money or other items to Fiji as donations. There are many stories of people losing loved ones, a number of people getting affected by the worst form of destruction and many surviving the raging winds and monstrous waves during Tropical Cyclone Winston. This is another story of survival that will be talked about for years in Nataleira village in Tailevu North. Fijivillage spoke to 32-year-old Aviuta Ramoli who fought the heavy sea swells for hours to keep his wife and four children together. Their house is located on the coast in Nataleira. The father of four said the first big wave that came beside their home sounded like a bomb explosion. He got his wife and four children to stay on top of a wardrobe however the wardrobe was not strong enough to hold all of them and it fell down. When water started rushing into their house, Ramoli quickly tied a rope around all their waists to ensure that they stay together. He held one of his sons and two daughters while his wife was holding their 1-year-old son. They then ran to Ramoli’s boat and got in to try to go to the evacuation centre. They then started drifting for about 20 to 30 kilometers. As heavy swells came, all of them including his wife and four children were pushed underwater. This happened a number of times. When the sea water went inside his mouth, Ramoli thought that he had lost his wife and children. He said that he could not feel his children hanging on to his back. Ramoli then heard one of his sons crying. The 6-year-old boy was stuck on a tree trunk. Ramoli grabbed him and then swam to his other son. They were out in the water until after 9 o’clock at night. They were later stuck on top of a bamboo tree. One of his children started choking as he had swallowed leaves and some stones. Ramoli acted quickly and started tapping his son’s back. He said his son felt better after vomiting. This was happening as they were battling the heavy swells. They stayed there until the water level went down to Ramoli’s waist. But they did not know where they were as they had drifted very far from the village. Ramoli said they were lucky that some villagers came out to search for them. They had to come out with a boat to get the family. When they reached the evacuation centre, Ramoli’s wife saw blood coming out of the nose and mouth of their 1-year-old son. He said that they didn’t know whether he was alive or dead. Ramoli then hugged him closely. He said they all just hugged each other after seeing the 1-year-old boy moving again. Ramoli said that he has learnt some great lessons from this and is just thankful that they are all together despite the trying times that lie ahead. 32-year-old Aviuta Ramoli describes how he and his family survived for hours in the water after their home was swept away by storm surge as a result of Cyclone Winston. These were the comments of 56-year-old bus driver Sarwan Singh of Naqere, Savusavu, who said there are more than 100 houses in his area and more than half have sustained major damages. Singh said people are now gathering whatever is left and are waiting for relief items. He said the devastation is massive and it will take a lot of time to rebuild their area. The National Disaster Management Office has identified schools in Tailevu, Ra, Lautoka, Nadi, Tavua, Ba, Labasa, Yasawa and Lomaiviti as the most affected by Severe Tropical Cyclone Winston. Some of the worst affected schools are QVS, RKS, Tavua College and schools on the island of Koro. Minister for National Disaster Management Inia Seruiratu said a further update on the schools affected by the cyclone will be provided to him this afternoon. He said this information was provided by the team who carried out an aerial damage assessment of schools around the country yesterday. About 80 schools have been damaged by Cyclone Winston. Emergency operation officials have started distributing rations in Tailevu, Ra, Vanuabalavu, Koro and Yasawa. They are also reporting back to the National Emergency Operations Centre with a ground assessment of the damage caused by Tropical Cyclone Winston in these islands. The Minister for National Disaster Management Inia Seruiratu said they have established communications in most of the worst affected areas through the help of the NZ Defense Aircraft Orion. He said part of the relief supplies are make shift tents to be used by the affected people. The Indian government has given USD$1 million to assist in the relief efforts after Cyclone Winston. Fiji’s national airline Fiji Airways has donated $1 million to the Prime Minister’s National Disaster Relief and Rehabilitation Fund to assist those affected by Cyclone Winston. Fiji Airways Managing Director and CEO Andre Viljoen handed the cheque to Prime Minister Voreqe Bainimarama today. The airline has also announced free carriage of relief supplies domestically and inbound from other countries coordinated through the National Disaster Management Office. Viljoen said Fiji Airways shares the pain of fellow Fijians at this time and will assist in any way they can to help rebuild our nation. Fiji Airways, under the direction of the NDMO, will freight in relief supplies on their inbound flights. Attorney General and Minister for Civil Aviation Aiyaz Sayed-Khaiyum said the government will be working closely with Fiji Airways throughout this crisis, not only making sure that relief supplies get to those who most need it but assisting the tourism industry to get back on its feet. Sayed-Khaiyum said the government, through Tourism Fiji, is working with Fiji Airways and industry stakeholders on a comprehensive plan to maintain the health of the industry in the wake of Cyclone Winston. He said that they need to get the message out to our key markets that most Fijian resorts are open and functioning. Sayed-Khaiyum said there is no need for intending holidaymakers to cancel or postpone their visits.